This small (~25 mm) elongated green frog is very common throughout the Samford district, usually close to water. 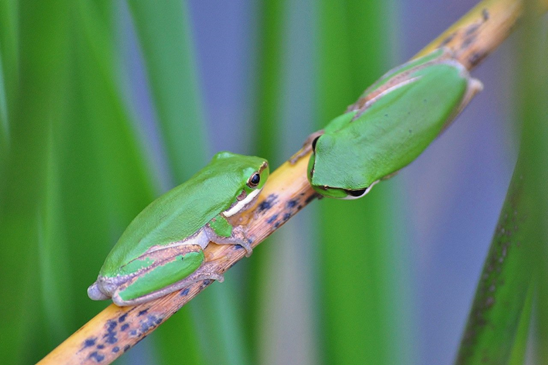 It is also known as the Dwarf Tree Frog or Green Reed Frog. The Eastern Sedgefrog is usually uniform green above (sometimes with dark flecking), but may be pale brown or fawn. A distinctive white stripe runs from below the eye to the base of the forearm and a dark stripe from the nostril through the eye. The backs of the thighs and legs (usually hidden) are yellowish or orange. The toes are three-quarters webbed, with distinct toe discs. The upper surface is smooth, but the white underside is granular. Sedgefrogs can be difficult to find and are more often heard calling (mainly from October to April) from emergent vegetation, with ratchet-like ‘re-ee-ek’ sometimes followed by staccato ‘pips’. They may shelter in bromeliads, bananas or other tropical vegetation in gardens. The eggs are laid singly or in foamy mats on the surface of water. The tadpoles (to 55 mm) have pale patterned bodies and dark tails with high tail fins. They are partying along our creek in the lovely rain. Thanks, Peter.